You're a person who doesn't follow sports. And you're fine with this unique wrinkle in your personality! But you have a job and a family. Colleagues and bosses. Friends and relatives. And a lot of them do follow sports. And at certain times of the year, social interaction is cranked up to 11. And one or more of these sports may be dominating any given conversation. Suddenly, your non-interest is a conversational liability. But fear not: you're smart and capable enough to survive! You just need a crib sheet. That’s where we come in. 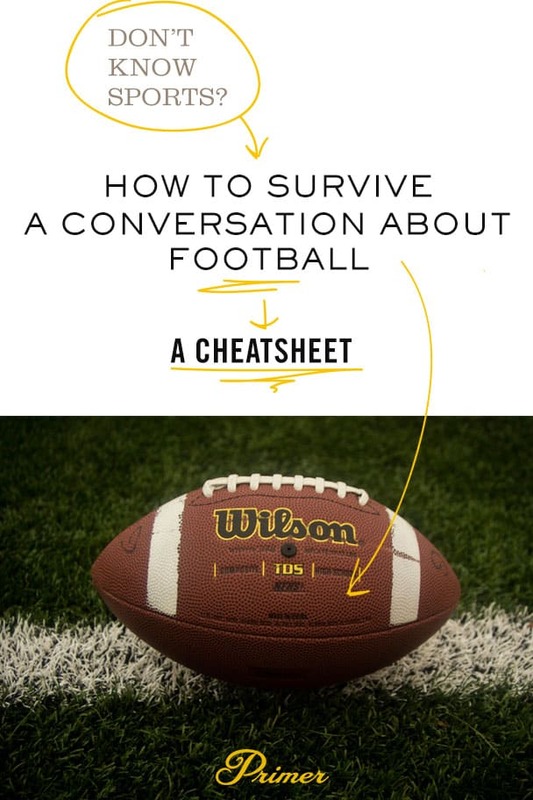 Use this guide and you'll be able to at least fake it in ANY social situation that requires a passing knowledge of the NFL. Print it out, transcribe it onto index cards, laminate it, hang it on your wall… however you want to learn, go ahead and learn. Just take it slow and keep your eye on the ball. Best players: Aaron Rodgers (Packers), Tom Brady (Patriots), Von Miller (Broncos), and Antonio Brown (Steelers). International influence: less than 1% — mostly from Canada, Germany, and England. Draft information: held in April, over 220 picks made of college players; draft order determined by winning percentage. Minor leagues: there are no official NFL-endorsed minor leagues; lower-level professional leagues like the Canadian Football League and United States Football League can sometimes be regarded as quasi-potential minor leagues. All-Star Game info: “The Pro Bowl” is held the weekend before the Super Bowl (late January or early February), in Orlando (it was previously held in Hawaii). Players and coaches generally do not take the game seriously and very few people pay any attention, at all. Most bizarre mascots: Texans, Packers, and Browns. The NFL and the Chicago Bears both changed their names on the same day in 1922 (previously, they were respectively known as the American Professional Football Association and the Chicago Staleys). Six teams don’t have any players’ numbers retired — the Ravens, Texans, and Jaguars are all too young of franchises while the Falcons, Cowboys, and Raiders have simply made it a practice not to retire jersey numbers. Coaches can challenge officials' calls twice (potentially three times) per game. The quarterback and one defensive player, per team, are permitted to have headsets built into their helmets so that coaches and coordinators can speak to them from the sideline. Best places to get informed: National Football Post and Football Outsiders. Random knowledge… You have eleven players, five of which are linemen and one is the quarterback. Packages are described with two numbers based on the number of backs and tightends out of the remaining five… 11 means one back, one tightend, three wide receivers. 22 is two backs, two tightends, one wide receiver, and so on. So if someone says, “They should use more eleven personnel to open up the passing game,” you will now get it. Similarly, a “nickel” defense, like the 5-cent piece, means there are 5 defensive backs (aka the players who are positioned the farthest away the offense). A “dime” defense is 6 defensive backs, only called so because it’s the next step up in currency from a nickel. Why would you have a picture of a college football then only talk about the NFL? Decent, for somebody “trying to survive a conversation” I suppose, but some of the content demonstrates a clear East coast bias (and I’m from MA, living in the Charlotte-area now). Why are the Raiders left off of the “best fans” list? Has the author never heard of the “black hole”? And this is a group of fans who have endured some pretty bad seasons from their team over the past two decades. Sticking with the silver and black, how are the Raider/Chiefs rivalry not included, but the Steelers/Bengals is? I know you can’t please everybody, just thought they deserve more recognition than the Ice Cube being a celebrity fan . . . It is because who ever wrote this list doesn’t really know what they are talking about. I like primer, but this is truly pitiful. Don’t forget! All of this knowledge is useless if you initiate your response by saying, “Oh you mean American Football?” ASK ME HOW I KNOW.